Great news for Fighting Fantasy – and gamebook fans in general: Tin Man Games’ Fighting Fantasy Classics will be expanding this week with not one, but two titles, bringing the grand total to an impressive ten. Oh, and one of the two is actually a personal favorite of mine, so needless to say, this has me more than a little excited. First up is part two of the Death Trap Dungeon trilogy, Trial of Champions, a journey that begins with… well, slavery. As in, you’re a slave. Best of luck with that – you’re going to need it, seeing how you start the adventure with nothing. Nothing. Absolutely nothing. I mean, no slaver in his/her right mind would let you keep any items, after all. That said, you will have certain modern advantages in this particular version, including a difficulty setting to increase or decrease the overall challenge as you see fit. But while that’s undeniably great news, I’d be lying if I said I wasn’t more interested in the other upcoming addition: House of Hell! That’s right, the gamebook I reviewed back in 2014 is about to become part of Fighting Fantasy Classics, complete with all the additional bells and whistles we’ve come to expect from other entries… and then some. 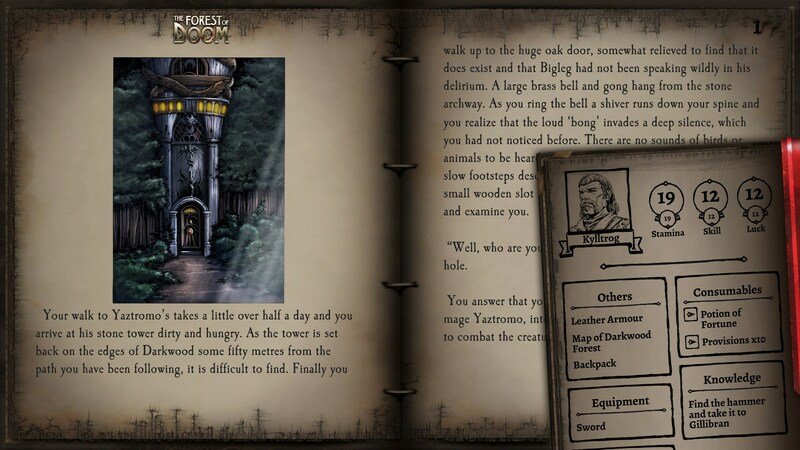 For example, while the adventure sheet obviously includes a way to track your Fear stat, there’s also a section to manage every clue you’ve stumbled upon – two features which are unique to House of Hell. As someone who still has and plays the printed edition, trust me, that last bit is quite the time saver. Chances are you’ll still die time and time again amongst its many traps and dead ends though, but that’s just how the book is designed, ya know? And I for one love it, annoyingly high amount of ‘game over’ sections and all. Oh and far as release dates go, we won’t have to wait long, Trial of Champions hitting Android and iOS on the 18th this month, with PC and Mac (read: Steam) versions due later that same week. I suspect House of Hell will be arriving at some point during that too, but we’ll see. Fighting Fantasy Classics is available on Steam, Google Play, iTunes; first book is free while every other carries a $3.99 price tag.